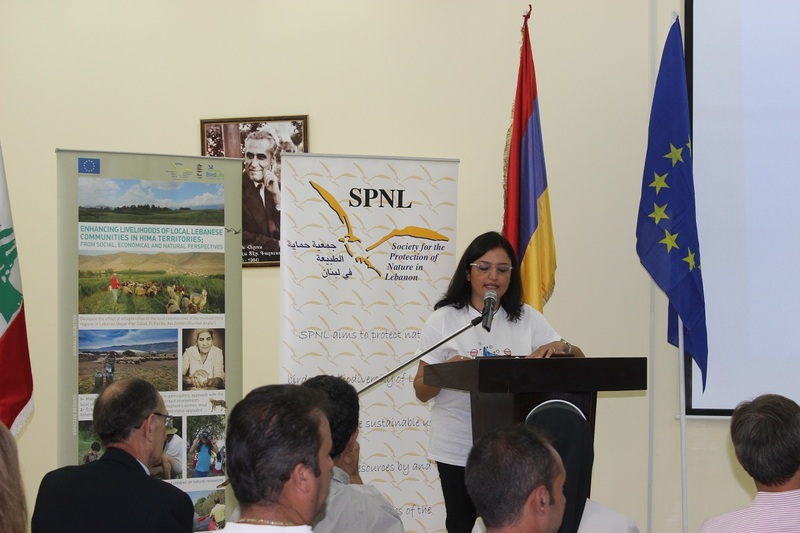 As a part of its yearly celebration for the Miracle of Bird Migration, and through the generous support of the European Union and MAVA Foundation , SPNL and the municipality of Anjar in collaboration with Jabalna Festival , celebrated the Miracle of Bird Migration under the title ‘Save Water for People and Nature’ ; and the launching of the EU funded project ” Enhancing livelihoods of Local Lebanese communities in Hima territories; from social, economical and natural perspectives “. Birds are very important in Lebanon because it lies on one of the most important migration corridors in the world for birds. But a lot of bird species coming through Lebanon are being killed, due to illegal hunting. To reach as many people as possible, the bird campaign, titled “Happy Birday,” will be the first Jabalna project in its seven-year history to take place in multiple locations: Hasbaya, first, then Faqra, Ehmej, Ehden, Maaser al-Chouf and wrapping up in Anjar. The event included several activities such as discovering Anjar’s Eagle Trail, a path along the culture of the Armenian village Umayyad city and spectacular nature, hike or bike along the water course from the Anjar spring to the Anjar Wetlands, and hike to the Mountain, support the Women products through traditional Souk, visiting the bird tower, and a musical show. The event concedes with the ‘Feast of the Cross Holiday’ which is celebrated in a distinguished way by the community of Anjar where a religious ceremony was organized on Sunday in Anjar Evangelical Church, traditional foods was offered including ‘ Hresee’. “We do celebrate because for us this festival comes to give hopes of life in a village where life was challenge one day. Anjar is the best place to celebrate this occasion ,where the suffering of the Armenian community in this village after they came here as refugees in the 1930s is the best example of prosperity for life, where they managed to turn a desert into a flourishing land represented by a prosperous agriculture beautiful green mountain, clean fresh water bodies,bubbling with life. So today what a better symbol we can give to celebrate life than a bird, in which the Lebanese spirit was always compared with a mystical bird the phoenix who always managed to continue being revived from ashes. Al-jawhary said in a word delivered on the occasion. Aiming to conserve the Important Bird Area from KfarZabad to Anjar where the IBA was announced as a Hima in both Anjar and Kfar Zabad through the continues collaboration with the municipalities, extending from the wetlands to the mountains. We managed to develop several projects with farmers, women and youth aiming to promote sustainable practices in relation to ecosystem management. 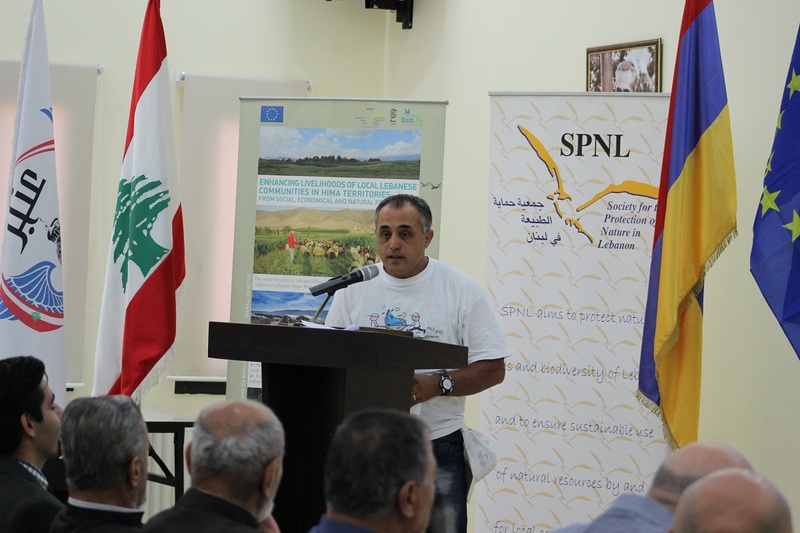 However SPNL has been highlighting in the past five years “the message of today’s festival “ to save water for nature and people “ through our collaboration with the municipality, Anjar water users association, Anjar and Kfar Zabad farmers, aiming to improve the management of water resources . Our projects included several initiatives from the improvement of infrastructure, to capacity building highlighted through extension service to farmers and WUA , to the scientific monitoring of water resources aiming to improve management. In addition to environmental education, where we have just concluded the education Hima summer camp which was taking place in Anjar in the past two days for kids of the age group 7 to 12 highlighting the value of water saving for people and nature . All of our projects and successes stories could not be possible without the support of our partners and donors including USAID, MAVA Foundation, European Union, UN Women Fund for Gender Equality, and other partners who continuously believe in our work . Al-jawhary added. Mr. Marcelo Mori from the Delegation of the European Union to Lebanon said that he is pleasured to announce the launching of the project “ Enhancing the livelihoods of local Lebanese communities in Hima territories; from social, economical, and natural prespectives” which aims to decrease the effects of Syrian influx on the local community of ( Anjar/ Kfar Zabad/ Fekhaa, Ain Zbdee ), thus improving the livelihood conditions of farmers, grazers, trout fishery and women in those areas. The results of this project will be reflected through the development of management plans , economical support, and out reach education educational program, and marketing tools for local products. This project represents a major boost for nature and the livelihood of the local community in the Hima territories, where nature conservation and water management can’t take place without considering the livelihoods of the local people in the improved management of nature resources, which is reflected under the Hima approach too. Mori added. 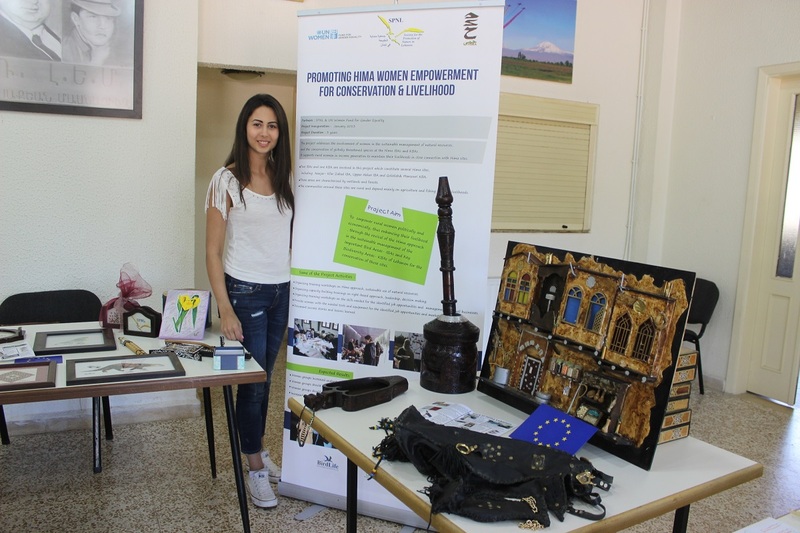 Representative of the Environment Committee in the Municipality of Anjar – Lina Stambolian thanked the European Union for their contribution and the Society for the Protection of Nature for their cooperation and coordination with the municipality and the local community in Anjar. 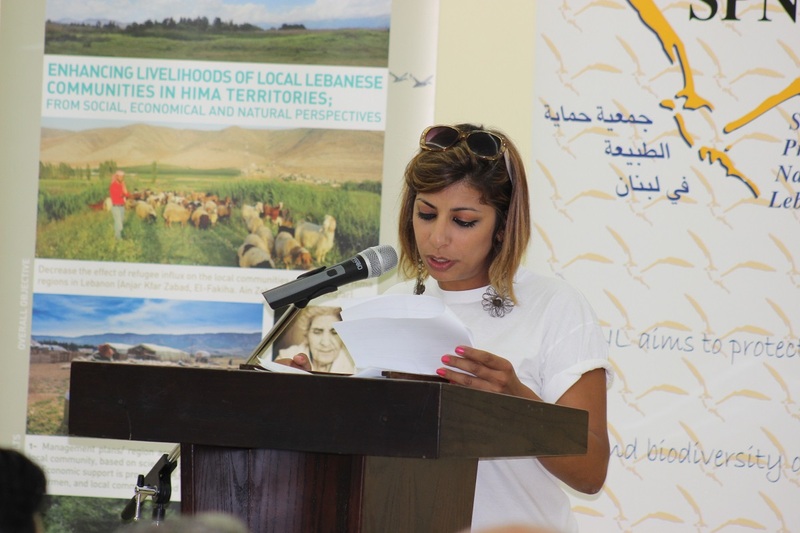 She stressed that the town, which is considered an important area for birds, stores cultural heritage and architectural legacy and has become an important site on the eco-tourism map of Lebanon.